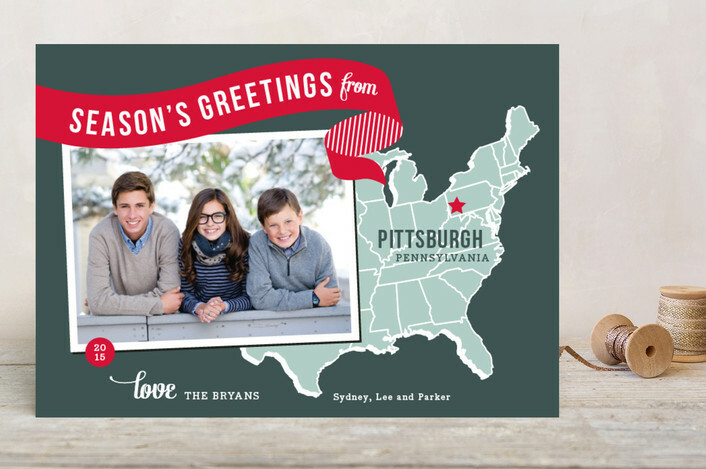 Spread a little Christmas cheer this year with personalized photo holiday cards from Minted! When you live in a town that's known as the "Christmas City", it's next to impossible to avoid getting swept up in the spirit of the holiday season. In fact, Stephen and I had brunch in Downtown Bethlehem this past Sunday and I couldn't help but smile at the way the shops and businesses were decorated -- green garlands accented by bright red bows, candles in the windows, and Moravian star ornaments and light fixtures hanging in prominent view. That probably explains why I've spent the past few days obsessing over the holiday card designs at Minted. With so many changes on the horizon for us, I feel even more compelled to capture the joy that we're feeling over and share it with everyone we know. That's why I love Minted's personalized photo cards -- you can choose from hundreds of designs created by independent artists and make them unique to you and your family by adding your own photos, selecting specific colors, and picking the card's shape. The only problem is, I want to order them all! To help narrow down my options, I've marked several favorites that I can play around with once I figure out which photo(s) to use. Keep reading to see which designs made my holiday card wish list, which design is currently on top of that list, and to get the details about a fun giveaway! And, the holiday card design at the top of my wish list? For obvious reasons, this design really speaks to me. Even though the past year has been full of memorable experiences and moments, bigger things definitely await us in 2015, especially with Baby Rittler due at the end of March. So, yes, I do believe that "the best is yet to come". Did any of the designs that I featured above catch your eye? Are you ready to choose a festive card design of your own to personalize and send to your friends and loved ones this holiday season? Minted will be providing one (1) winner with a $50 gift code to use toward your online holiday card order! This giveaway is open to US residents only and will end at 5:00 PM EST on Friday, December 5, 2014. Good luck!! Taste As You Go Disclaimer: I received a gift code for Minted.com in exchange for this blog post. Minted.com will be providing the prize for this giveaway. All opinions expressed are my own.